DoubleRadius is pleased to announce that we are now a North American distributor for Alpha Wireless, an antenna designer and manufacturer headquartered in Ireland. Alpha's solutions are affordable, and carrier deployed globally. Fixed wireless service providers face the daunting task of satisfying growing demand for coverage and capacity while minimizing the cost to serve, and Alpha Wireless is addressing this by changing the way wireless networks are built. Read full press release here. DoubleRadius' goal is to be our customer's partner for building better networks. We are always looking for products that improve our customer's networks, considering factors such as capacity and optimizing limited spectrum available. Alpha Wireless' new cost-effective AW3697 fits that bill. Announced at WISPAmerica 2019, the new AW3697 is an 8-port dual band work horse. The AW3697 offers an affordable and reliable antenna solution that supports both 3 GHz and 5 GHz radios in the same antenna. Combining these frequencies in the same antenna gives WISP operators the ability to save tower space and money on lease fees. “We are excited to partner with Alpha. The two of us make a formidable wireless team for service providers and utilities. We are optimistic on the growth we can have with such a strong antenna manufacturer,” said Gerry Ford, DoubleRadius President. 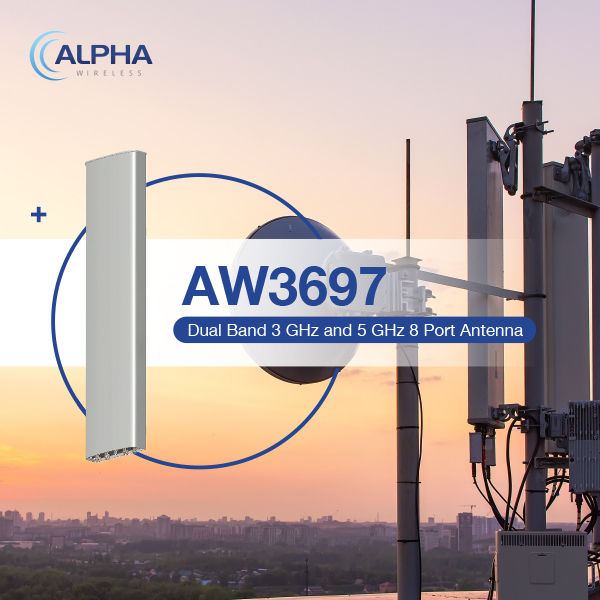 With high-quality antennas like the AW3697, Alpha Wireless will be a valuable resource for WISPs, utilities , and others.